OK, so it’s not rocket science…but you’d be amazed at how often we’re called in when others have failed to get the job DONE RIGHT. If you have any kind of clog, repair or leak in your plumbing system, our plumbers will be there in a flash! We’ll share with you your options, and we’ll take care of it quickly, as you wish leaving you in peace…problem free. We tend to take our plumbing for granted, as long as it works well, but so much has changed since our home’s plumbing was installed. Just think, twenty years ago, there wasn’t ipods, laptops and cell phones. Most of our plumbing systems are much older than that. * Hot Water Recirculation systems that give us instant hot water at each fixture so we don’t have to wait and waste water while we wait for it. * Insta-Hot faucets at our kitchen sinks, that make hot cocoa, tea, coffee, and instant oatmeal just a moment away. * Food Disposers that make kitchen clean up a breeze. * Outside Faucets that can provide hot and cold water and don’t freeze. Whatever your need, you will find expert plumbers at APSCO Plumbing to help you update your plumbing system. Whether you are replacing your entire system with new copper or Aquapex piping, or adding a new feature, we do it all…leaving you 100% satisfied. Toilets, faucets, leaks, and plumbing systems. Copper re-pipes, aquapex re-pipes, drain lines, water lines, water heaters. 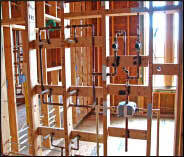 Move water lines, move drain lines, expand an existing systems, bathroom additions. Backflow assembly installation/testing, water purification systems, sewer pumps.